I received a free bottle for review purposes, which my husband and I tested in combination with the shampoo by the same brand. I think the two work beautifully together and we really like both products. The plastic bottle is tall and narrow but quite stable and fits easily in my shower basket. Like the shampoo, it's a unisex product because the fragrance is light and fresh, and not at all sweet. This conditioner works a little differently from others I have tried, in that it's not sleek, creamy or oily. The consistency is similar to a thick milky face lotion, it is absorbed quickly and does not leave behind much residue to rinse away. It's difficult to find a hair conditioner with so many natural ingredients, in this case flower and plant extracts, and I've noticed that the repair action increases with each use. At first, it might even feel drying, but give it time and you may be surprised. My hair feels really clean and bouncy after using the two products, and it's manageable and easy to brush even now that it's past shoulder length. My husband has a lot of very fine hair, which other products tend to flatten down. This combo does the opposite for him, and he actually needs a little gel to tone down the volume. Lovely natural shine and very volumizing. Quite a discovery, and I love that it's not tested on animals! We'll be using this brand again when our samples are finished. The first thing I noticed about this premium shampoo is that it's very concentrated and so the 8 oz. bottle lasts longer than expected. The formula is low-sudsing but a second pass produces a lot more foam. It leaves hair really squeaky clean but also soft and naturally bouncy. We were offered a free bottle to test in combination with the conditioner by the same brand and we find that the two work extremely well together (my husband has been using it, too). The plastic bottle is tall and narrow but not tippy. Easy to store in my shower basket. A very light, fresh fragrance makes it suitable for both ladies and gents. 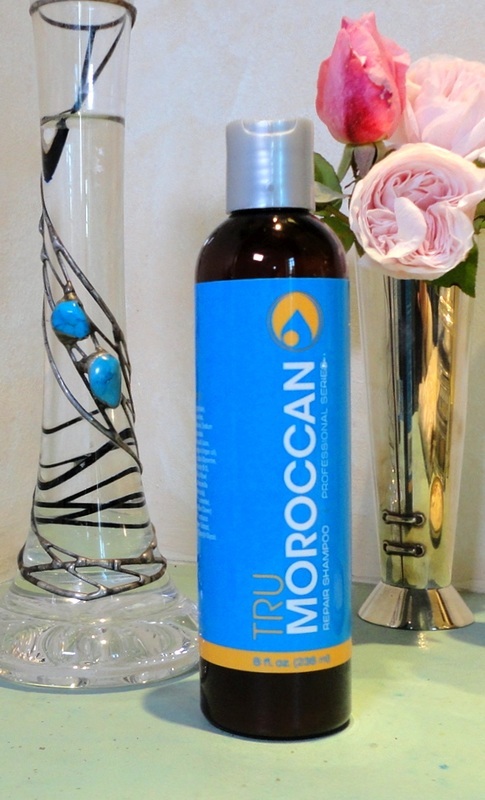 Moroccan Argan Oil seems to be the ingredient of choice for hair products at the moment, but it comes in as many types as there are brands selling it. 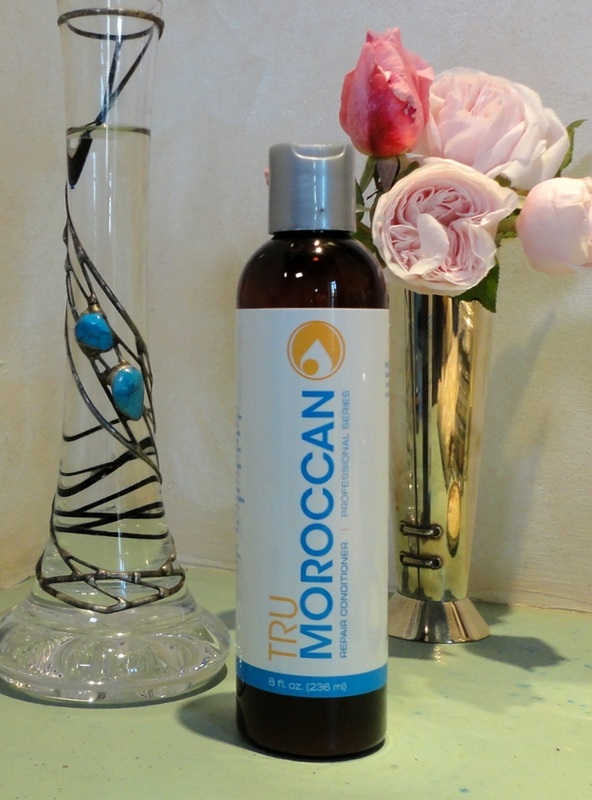 This Tru Moroccan shampoo is a delicious blend of plant extracts, complementing a remarkably light but effective Argan Oil base. That it's not tested on animals makes it perfect in my eyes! My dry, coloured hair emerges looking smooth and (dare I say it?) silky, and I had not seen such a shine in a long time.